It’s not easy getting outside of Marrakech if you don’t have transport planned out ahead of time. 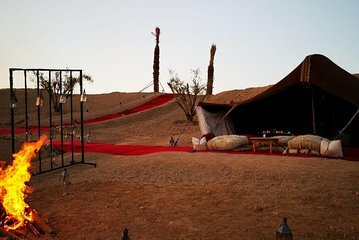 This magical dinner in the Marrakech desert makes it simple to enjoy a night outside the city’s bustle by providing round-trip transport from your hotel to Agafay. Once you arrive, find a spot either under the starry night sky or under a comfortable tent, and indulge in a traditional Moroccan dinner. This dinner was truly the highlight of our time in Morocco. The location, staff and meal were superb. I would recommend to anyone visiting Marrakech.